Explore vital information about communities such as monthly fees, entry fees, contract options, healthcare services provided and much more. 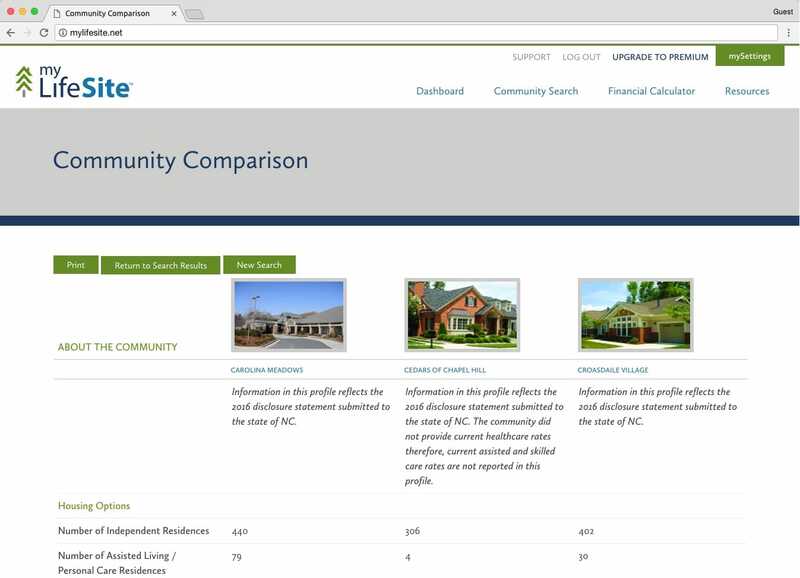 Compare communities with 30 data points such as monthly fees, entry fees, housing options, Medicare acceptance, amenities, and much more. Can you afford the community of your choice? Go no further. 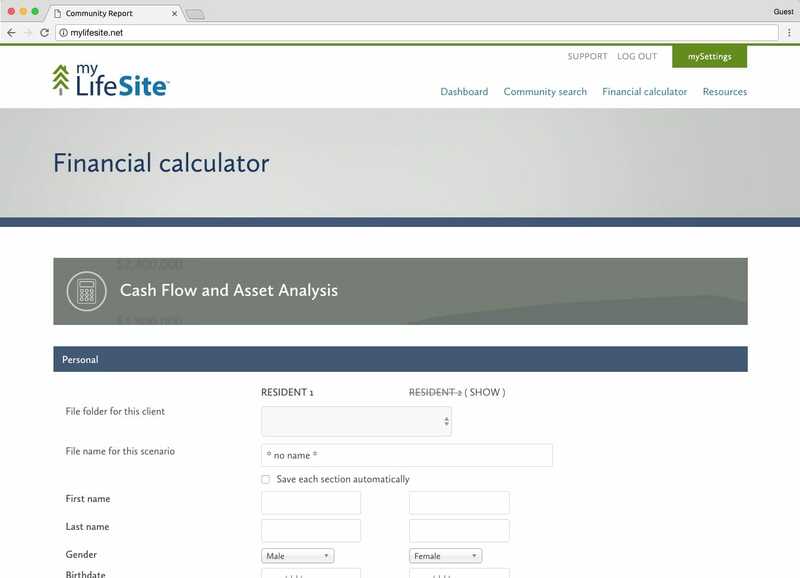 Our founders are a CPA and a financial planner, so we custom built a financial calculator specific for the implications of moving into a retirement community. 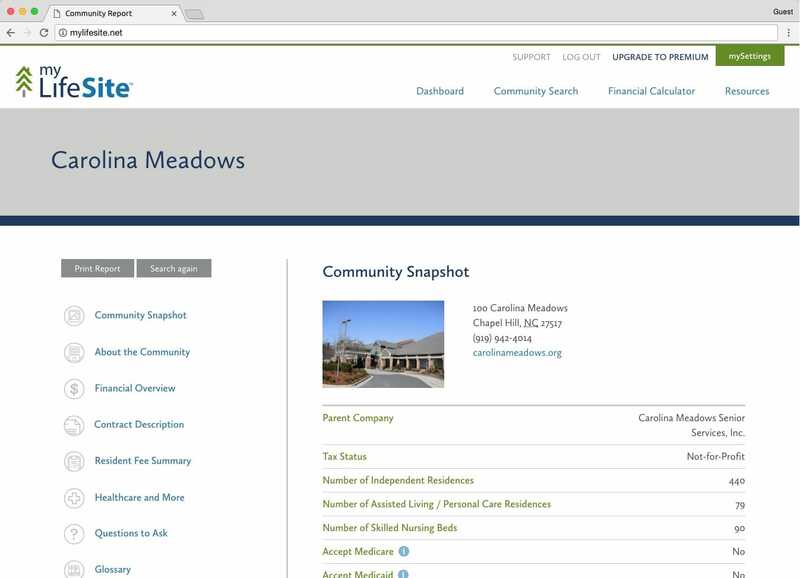 Striving to improve your knowledge of retirement communities? 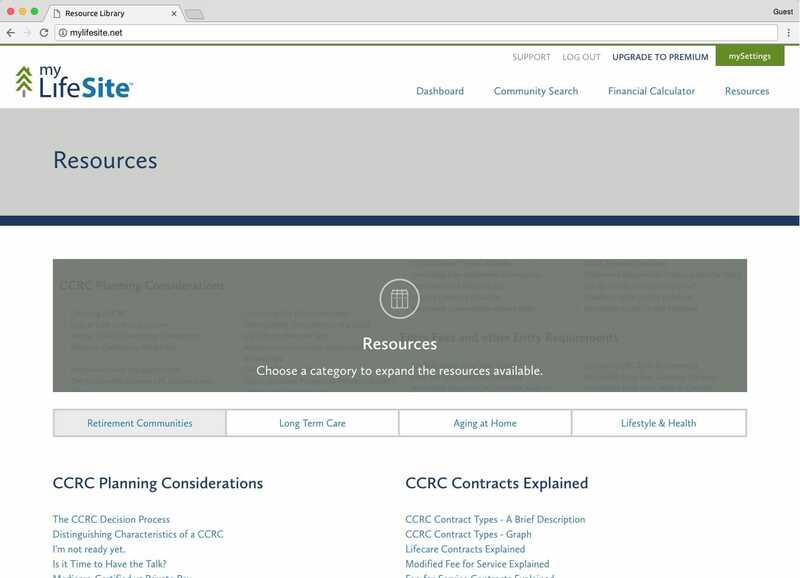 myLifeSite’s Resource Library is loaded with instructional videos, useful guides, and simple explanations for the industries’ confusing terminology. You’ll be up to speed in no time. Unlike other senior living websites, retirement communities don’t pay us for your contact information. We keep that information fully confidential. Because you are customer, our information is unbiased. Let’s face it —affordability and pricing are key factors in deciding what community will be the best fit. We help you understand those confusing questions throughout the process. Have you read the fine print? We have. While you still need to hire a professional before you sign any contract, we do the initial reading for you — helping you during the exploration phase. Most of the information on the Internet is generic and therefore not useful. But our researchers uncover the important information you really need to understand a specific community’s strengths and weaknesses. Many consumers pay consultants thousands of dollars to research the information we provide at your fingertips. Start for free today to get acquainted with our offerings, but by upgrading to premium you will get full access to all of our research. Our co-founder Brad Breeding is a senior living thought-leader. He is a nationally recognized speaker about the financial implications of moving into CCRCs and is often quoted in the news and media.